This little device is certainly not going to pose any conflict with the rumored HTC One Mini, but if it is priced right, it will attract the budget minded user for sure. Just like with many leaks, no pricing is available, nor is there a suspected release date. This device will probably be offered only in developing markets and perhaps other parts of Asia, and once you see the specifications and video you will understand why. Physically, the Desire 200 is unassuming. The design language is on point with HTC, a long earpiece appearance borrowed from the HTC One, one the back there is a camera which we guess will be a 5MP sensor, sans flash. Underneath there is a 1,400mAh battery, access to a microSD card slot and a mini-SIM card slot (when was the last time you saw one of those?). Bringing the whole show together is a single-core 1GHz CPU, 512MB of RAM, 4GB of storage and Android 4.0 Ice Cream Sandwich running underneath Sense 4.0. The display is a 3.5-inch 320x480 (HVGA) LCD unit. Rounding it all up is Beats Audio. As you can see, the HTC Desire 200 shares little with its bigger cousin the HTC Desire 600 which is just now beginning to hit the market. The video below shows a 7-minute length, but it is really only about 3-and-a-half. Right at about 3:25, you should consider turning down the volume. Looks like lumia 520 remain the king of cheap phone category... with this kind of specs on android phone, how about NO!! You sure you don't want it , oh what a tragedy for HTC . Are you wendygarett really? I thought you were banned. The One Mini should be their only cheap phone, they're back to 10 new phones every quarter. 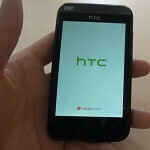 Since the beginning of the year they released the One, One SV, First, Desire 600, the Desire 200 and the One mini are upcoming. So 6 phones, which is far from 10. Samsung so far has 4 Galaxy S4 variants and about 15 phones released since the begginning of the year.